In this segment, Bill and I will be discussing the possibility of there being a time gap between the Rapture and the beginning of the Tribulation. 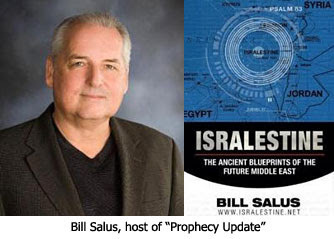 Bill Salus: Welcome to another edition of the Prophecy Update Radio Program whereby we intend to authenticate the sovereignty of God through Bible prophecy by telling you what Bible prophecy has to say about these last days. I am your host Bill Salus, and I am delighted to have with me Nathan Jones of Lamb and Lion Ministries. Nathan and I happen to be in Dallas at the Pre-Trib Conference sponsored by Thomas Ice and Tim LaHaye where there are all kinds of interesting topics being discussed today about the Rapture. Today, I thought we would pick up on the theme of the Rapture. Bill Salus: In my estimation, and I think Nathan will concur and I will allow him to say his thoughts on this, that there are four major prophetic events that the Church should be watching for. One is the Rapture, two is Psalm 83 the Arab Israeli Conflict, three is the destruction of Damascus in Isaiah 17, and four is the Ezekiel 38-39 Russian-Iranian lead invasion of Israel. These four wars are not necessarily listed in order and, of course, we don't know exactly when the Rapture is going to occur. Nathan, do you concur that those are the four big prophetic events we should be watching out for? Nathan Jones: Yes, those cover everything that happens up to the Tribulation. If you want to talk about a fifth big prophetic event then that would be the Tribulation, but I don't think the Church is going to be here for that. Bill Salus: Correct. We are talking about a Pre-Tribulation Rapture, meaning that Christ comes and takes out His Bride the Church before the beginning of the Tribulation. Bill Salus: Now, Nathan, let's start by talking about the Rapture. It is an imminent event. Is that correct? And, what does that mean? Nathan Jones: Imminency means that the Rapture can happen at any time. It doesn't have to have any kind of prophetic event to happen before it does. For instance, when we talk about Jesus' Second Coming we know that all sorts of events occur during the Tribulation — the Antichrist's rise, the one world government, all the different battles, the destruction of the Earth — all have to happen before Jesus comes back. But, for the Rapture, none of that has to happen. It can happen at any time. Bill Salus: A lot of people who've read my work on the Psalm 83 — Isralestine — have somehow confused the central theme with the thought that I am suggesting that the Rapture can't be an imminent event because the Arab Israeli War of Psalm 83 has to occur prior. Now, in previous discussions with Dr. David Reagan and others, we have discussed that is not of course what I am saying, nor is that what I believe. Basically, how do you feel about the timing of Psalm 83 in relation to the Rapture? Could the Rapture happen before or after a Psalm 83 war? Nathan Jones: I think a lot of us, myself included, while growing up would look at the Rapture and think the Rapture happens and then — Boom! — the next day the Tribulation begins. And so, the idea that there could be anything that happens between the Rapture and the Tribulation is a fairly new concept, at least for me. I talk to different people as Web Minister, interacting with people all over the world who send in their questions. I try to answer them to the best of my ability, or I ask Dr. Reagan for some answers. I get a sense from these communications that the idea that Psalm 83 or Ezekiel 38-39 could happen after the Rapture but before the Tribulation is something new. People are still getting their minds I think wrapped around that idea. I know I am a little, too, because like I said, I grew up thinking the Rapture kicks off the Tribulation. But, the Tribulation doesn't begin until the Antichrist makes a peace treaty with Israel, which we can read about in Daniel 9:26-27. That is the actual event that starts the Tribulation, and not the Rapture. Bill Salus: Right. It is called the "Covenant with Death" and the "Agreement with Sheol" in Isaiah 28:15 and 18. You make a good point, Nathan. I think that many Christians, whether they are prophetically inclined or not, have grown up with the old school thought that the Rapture occurs and then the Tribulation begins almost within the same 24 hour span. But, like you said, what commences the seven year Tribulation period is this false covenant with Israel. We just don't know how long the time gap is going to be between the Rapture of the Church and the commencement of the Tribulation with the confirmation of the false government. And so, we are all starting to think through this time gap idea and see how it could fit in there in relation to these Israeli war prophecies of Psalm 83 and Ezekiel 38-39 and Damascus in Isaiah 17:1 and whether the Rapture precedes these events or not. The idea of a Rapture is newish to me. The church I grew up in only taught 2nd Coming. I didn't know what the Rapture was until a few years ago. my one question is after the rapture and Gog/magog how long will it take for the remaining events to occur? as of now they could take years but the rapture and Gog/magog would change everything so i wonder: how long?